The rear of 'Spring Hill', the Henry Carnegie Phipps estate designed by John Russell Pope (for William L. Stow) in 1903 in Old Westbury from a 1932 copy of Fortune Magazine. Click HERE for more on 'Spring Hill'. The house in the background is the Dewees Dilworth residence 'Gloan House', which can be seen HERE. What is that building in the background in the upper left hand corner? it looks really familiar.....it's not harbor hill is it? The house stood just north of Whitney Garvan Phipps Drive, slightly to the west(and across WGP Drive) of Spring Hill in what is now Nob Hill/Lakeville Estates. 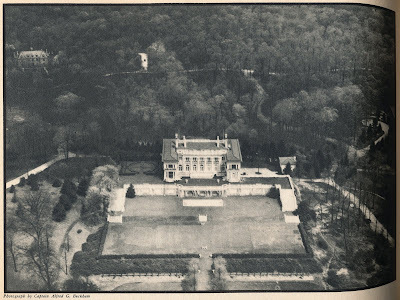 There is an excellent aerial photo of Spring Hill and the Dilworth house in the June,1932 edition of Fortune. Not extant on 1966 aerial of Garvan and vicinity. does the house that's currently on glen cove rd,(475) have anything to do with Gloan house? it stands apart from the rest of the current development. That house was the gatehouse for John Mackay's house which is still standing - on Melby Lane.